I've been talking a lot about how Canada's own economic crisis isn't going to be sudden but rather a gradual decline, each year getting worse from now on. The reason it's going to be gradual is that our economy is sort of like a giant amplifier based on a subset of actual production. In a way, our economy appears larger than it actually is. 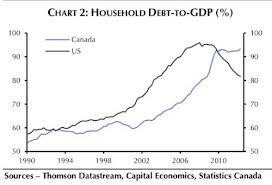 Up until now this has worked to our favour allowing us to spend big and borrow big while maintaining tolerable Debt to GDP ratios albeit consumer debt is off the charts. I know it's not perfect but, in a nutshell, due to the way Canada currently operates it's economy when foreign countries are doing well we also are doing well primarily because we rely so heavily on foreign investment, particularly with the U.S. which of course has massive resources to spend and few countries bordering it to spend in. Firstly, we significantly underestimate the amount of value added to our economy by U.S. trade, and even more so the number of U.S. chain stores here. Imagine what most malls might look like if every store inside them that originated in the U.S. wasn't there, pretty empty. Another way to put this is we live larger than we are, economically. Everyone has seen the image comparing U.S. and Canadian household debt. During the U.S.'s Bush "boom" (which we all now know was just banking fraud) the growth outlook increased significantly especially considering it just followed the "dot-com" bust. The cheap availability of loans cycles more "growth" which improves the outlook which makes loans even more available. In general, the better the outlook the more available loans are. Since loans are the foundation of most foreign and domestic production, as well as consumer spending, more loans in the virtual fantasy world of the Keynesian economist should automatically equal more consumption which should automatically equal more GDP. The above cycle completes and so long as more and more foreign investment/exports keep filling in the holes left by our miniature domestic production we are able to live at the scale offered by such liquidity. But what if the cycle were to reverse? That is what I believe is happening now. This is a serious problem because we're just as amped up in debt as the Americans are but we only have a fraction of the production to back it up with. This is why our "leaders" are desperate to get investors, any investors, ethical or not. The faltering U.S. is a bad omen for Canada who has been modelling growth and standard of living and debt servicing based on the added value provided by U.S. business, business which as the U.S. falls faster and faster down that fiscal cliff will become increasingly unstable. A) "Flaherty's Tights" are not responsible for the housing slowdown. B) You know something is out of whack when at a time of worsening economic outlooks banks are making loans more available and easier to get especially when Canadian houses are 20% overvalued. Canada, this is your moment of realization about the logical fallacy that is our housing conundrum. All of our lifelines are collapsing into their own economic circuses leaving us with debt ratios our meagre domestic production will not be able to service. As foreign investment becomes more unstable, outlooks are going to continue to worsen and money is going to keep coming up short. These will eventually affect loan availability as banks come to terms with the current reality and economic outlooks and adjust accordingly. This is how our economic crisis will come about, worsening outlooks affecting loan availability which in turn comes back around to lower outlooks even more. Dampening the future, slow and steady. Definitely, Canada has shown relatively good economic performance during the crisis. Still, the situation is shaky and all people want is to protect themselves in case of any financial instability. Often situations arise when people are in need of some temporary cash urgently, they but do not have adequate funds. In this case pay day loan for Canada residents might help people feel financial security. These quick cash loans provide access to short term credits to meet any emergency requirements.